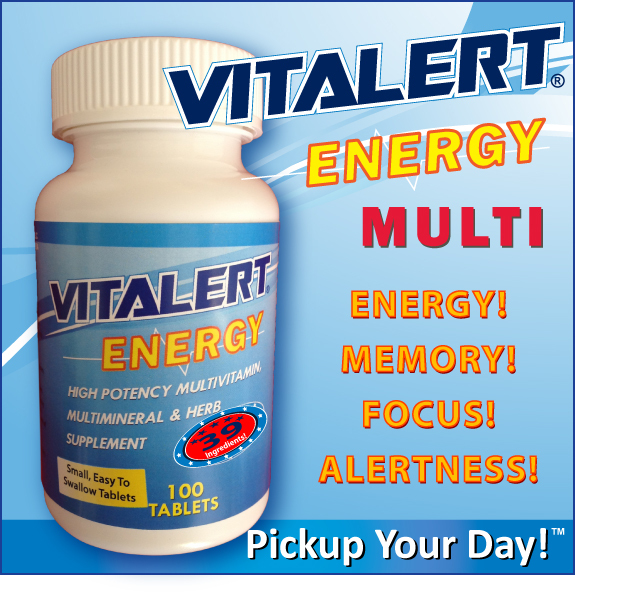 VITALERT® ENERGY MULTIVITAMIN 100 TABLETS FOR ENERGY & MEMORY! LOADED WITH 39 INGREDIENTS! Major SALE Today! $4.00 OFF ea. bottle! (Reg. Price $16.99) Made in the USA. Secure your bottles now! Supply is limited (Limit 12 bottles per household). Also, use FREE SHIPPING (Save $6.95) Promo Code: 2010639 during checkout (min. 4 bottles). Best Daily Multi-vitamin for ENERGY, MEMORY & STAMINA! Specially Formulated for the Savvy Health-Conscious Consumer who Expects so much more from a Daily Multi-Vitamin! Pickup Your Day with VITALERT®! VITALERT® Energy Multivitamin, Multimineral & Herb Supplement - LOADED with 39 INGREDIENTS! Supports ENERGY*, MEMORY*, ALERTNESS*, FOCUS* & STAMINA*! Manufactured in the USA! See ARTICLE (click here!) at LoveToKnow.com "Expert Advice" website by Kathryn Vera, Registered Dietitian! FLAT-RATE SHIPPING! Long Expiration Dates! Vitalert® Energy Multivitamin, Multimineral & Herb Supplement a DAILY comprehensive High Potency Formula that is LOADED with a combination of 39 Essential Vitamins, Minerals, Electrolytes, Antioxidants, and Herbs for sustained Energy*, Memory*, Alertness*, and Optimal Health. It combines a complete array of nutrients with the convenience of easy to swallow tablets. Directions: As a dietary supplement, take four tablets once a day with food, or as directed by a healthcare professional. Manufactured in a cGMP Certified Facility located in the USA! Contains no added sugar, salt, starch, yeast, gelatin, gluten, artificial colors, flavors or preservatives. Allergen information: Contains soy ingredient. Note: Consult a healthcare professional before using this product if you are under doctor’s care, taking medication, pregnant, or nursing. Store in cool, dry place. Do not use this product if the safety seal on the bottle is broken. Soy Protein, Ginger (root), Gotu Kola (herb), Quercetin. Other ingredients: Microcrystalline cellulose, stearic acid, croscarmellose sodium, magnesium stearate, silicon dioxide, natural vanilla flavor, hydroxypropyl cellulose, hypromellose, polydextrose, titanium dioxide, riboflavin, talc, maltodextrin, medium chain triglycerides. †These statements have not been evaluated by the Food and Drug Administration. This product is not intended to diagnose, treat, cure or prevent a disease. Product not for resale! For personal use only!